It may be apparent already that I have a thing for Bottega Veneta. Here are the posts where I’ve mentioned something bearing its stamp or commented on its position in the luxury market. My first interaction with the brand was through MR PORTER back in 2013, with the sale purchase of a simple black card wallet. Which, I still use daily as it has held up impressively. In fairness, I baby it—and most things I buy to ensure they last. I admire Bottega’s aesthetics and subtleties, but even more, its consistency. I am human of habit and familiarity, and I have always preferred in life the investments that are timeless. So much beauty can be underlined and created through careful consideration over caprice. Bottega Veneta, as I wrote last June, falls into a category some call ‘stealth wealth’ because it never flashes logos or monograms, but instead signals via well-known handiwork like its most famous product, the interwoven leather called intrecciato. Its clothes and shoes are understated, albeit made with the utmost care and craft. Bottega Veneta FW15 sale purchases! Brown suede oxfords with a criss-crossed gingham-esque print, dark red burnished brogues, and “rice-grain” leather boots on a crepe sole. Many would call it boring, and that is OK. I and the things I like have often been accused of dullness. Simply put, too much of life is loud and abrasive—attention through bluntness. Internally and externally, I cringe at the idea of being so topical, so obvious. The best things in life are coy, with quiet elegance and meaning hiding below the surface. This is how Bottega Veneta’s products, and everything surrounding its name, like the stores and sales associates I meet, make me feel. So much so, that I immediately jumped on the opportunity to apply for an internship with the company, a requirement as part of my MBA. If and when I have an end to that story, trust me you’ll hear about it! Bottega Veneta is owned by Kering Group, which also owns and manages famous brands like Gucci, Saint Laurent, Balenciaga, Stella McCartney, and Brioni. Initially, this might be worrisome, as strong-armed owners can ruin the specialness that small-medium brands have in customer intimacy and commitment to quality. After observing and reading about the brand’s history and rise, it seems Kering is well aware of the value proposition Bottega offers—that it isn’t the same, say, as Saint Laurent. Founded in 1966, it fell out of popularity and was near folding when Kering purchased it in the late 1990s, subsequently appointing Tomas Maier as creative director in 2001. He has remained in that position since, working to build the brand’s global prowess. Fifteen years is a long time to remain at a luxury brand, and it speaks to the ethos of the brand I mentioned before. Today, growth has occurred without impacting the brand’s core competencies. There are stores on nearly every continent, especially in Asia, with upwards of 60 across China and Japan. 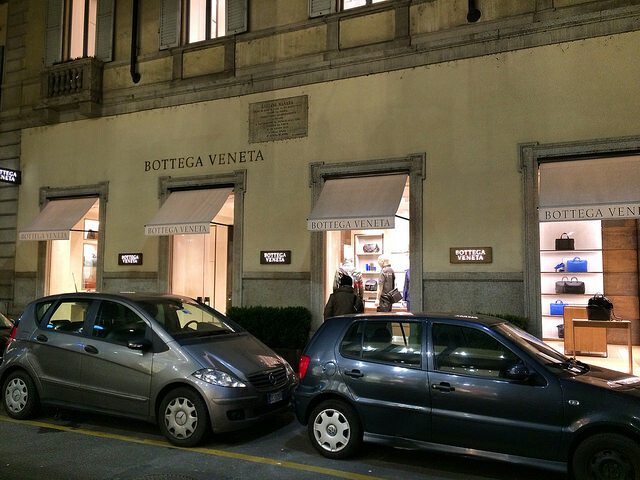 The title of this post hasn’t been lost, and my intent is to introduce Bottega Veneta’s home decor line and store, which is a few hundred meters from its other boutiques in Milan’s center. On Via Borgospesso, there are handful of high-end design boutiques and its easy to miss the one inside a historic mansion from nearly 300 years ago. Inside, you will find furniture, flat- and table-ware, lighting elements, and desk accessories that mimic the simplicity and elegance of Bottega’s wearable lines. Like the other stores, too, the home store exists in a world of muted colors, hushed spaces, and warm but unobtrusive assistance. I met Katherine Peña, a Dominican native and interior designer, who guided me through each of the store’s spaces. I couldn’t consider buying even the smallest of items, which like the rest of the brand, commands a well-rounded sum. Nonetheless, I can appreciate the marriage of comfort and quiet design, which is neither modern nor retro, but somewhere in between. Somehow, it all fit well with the building, which is unmistakably old, but timelessly beautiful. I could spend hours sitting and reading under its frescoed ceilings. I don’t know much about interior design, but I did learn a thing or two growing up with an art-history major / graphic designer mother, who would have appreciated the beauty of this space, even if she preferred more modish furniture and streamlined architecture. She hated dark spaces, so a lot more light would be necessary. As I wrote in the previous post, Villa Necchi provides some insights into the interior design history of Milan, and I think this store does too. Bottega Veneta Home launches a new collection at Salone del Mobile this year (Milan’s design fair), so it will be interesting to see how the offering evolves. I don’t expect drastic changes, per the flavor of the brand’s Creative Director—which will please me just fine. Here is the PDF BV home collection catalog. I am not a fan of BV, although I agree with what you said, for whatever reason it does not strike me. I can see others consuming it, but not me really. Maybe because deep in my mind it is classified as an “old people” brand. Well, we shall read this post again in 3y from now and see how much older (or not) I got!